The Central Bank released the publication “A Guide to Financial Services in Sri Lanka” specifically compiled for the awareness of the general public on the financial institutions in Sri Lanka. This publication was authored by Mr. P Samarasiri, Deputy Governor, in honor and gratitude to Mr. A S Jayawardena, the Governor November 1995 – June 2004, who proposed and guided Mr. Samarasiri to compile and release this publication first time in April 2002 in order to educate the general public on basic financial services in Sri Lanka. The publication contains basic information on financial institutions, their services, lists of various institutions licensed by the Central Bank, nature of regulation and supervision and safety of public transactions with financial institutions and is presented in a reader-friendly language while keeping its original format. Coins used through different time periods of a country play an important role when studying the history of that country. Although small in size, a coin has the ability of giving a wealth of information about the economic and cultural history of the country where it was used, through signs that remain on them. The exhibition, “From Purana to the Rupee”, was created based on the coins, notes and other artifacts previously housed at the Currency Museum of the Central Bank of Sri Lanka. Being prelude to the “Economic History Museum of Sri Lanka”, this exhibition will become a part of the museum once its construction is completed. This booklet, “From Purana to the Rupee” presents the long story of Sri Lankan currency in a simple language. This is the fourth book authored by Mr. P Samarasiri, Deputy Governor of Central Bank of Sri Lanka and published by the Central Bank. The book’s presentation is targeted for students, teachers and policymakers who look for basics on financial transactions and operations of a financial system. The book presents the financial system based on five components covering money, central bank, financial institutions, financial markets and financial safety net mechanism with a special focus on Sri Lanka. In addition, a summary description of fundamental topics is also given in the first Chapter. The coverage and presentation of the book are reader-friendly and provide readers with a fair guide to study how a financial system operates. The readers can study further theoretical and practical details from other reading sources by taking this book as a guide. This coffee table book marks the launch of the special mint of Rs. 10 coins by the Central Bank of Sri Lanka in recognition of the administrative districts of our nation. Within the pages of this book which celebrates the 25 districts of Sri Lanka and the launch of the 25 districts of coins, we invite you to catch a glimpse of each district, its true potential and the lives of the people lead, providing a snapshot of Sri Lanka: Our People and Our Potential, in which we hold Our Pride. The above book is authored by Mr. C P A Karunatilake, Director, Centre for Banking Studies, the training arm of the Central Bank of Sri Lanka.The purpose of writing this book is to supplement the literature available on this subject for beginners, aiming at a readership of GCE Advance Level student, university students and academics. While, the main focus of the book has been the GCE A/L syllabus, each chapter has been extended beyond that scope, so that the University students and other academic and professional aspirants also could benefit. The Central Bank employs various publications and study programmes to improve the economic and financial knowledge of the public and this book is another milestone in reaching this objective. Over the past 60 years, the Central Bank of Sri Lanka has consistently endeavoured to ensure macroeconomic stability, and function as an institution that is sensitive to the needs of the people. The Bank has also taken the necessary steps over this period as the authority on monetary management and the regulator of the financial system to achieve price stability and financial system stability and thereby contribute to the prosperity of Sri Lanka. At the same time, the Bank has facilitated the expansion of the financial system and helped improve financial inclusiveness. Significant improvements have also been effected in many other aspects of Bank’s activities, such as currency management, foreign exchange management, public debt management and the management of the Employees’ Provident Fund. This publication effectively captures the challenges faced, trials endured and silent victories recorded by the Central Bank of Sri Lanka in this long and exciting journey, while also documenting important events and developments in the different aspects of the economy. This compilation provides an informative account of the Sri Lankan economy and the Central Bank of Sri Lanka during the period from 1950 to 2010. 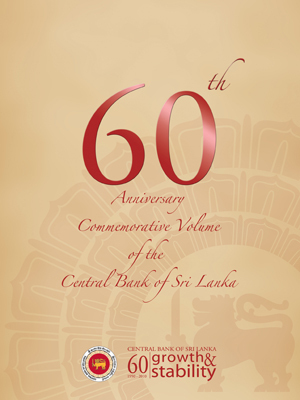 The Central Bank of Sri Lanka is pleased to publish this volume containing the 10 orations delivered by eminent speakers under its 60th Anniversary Oration Series. hese Orations, oeganized by the Central Bank of Sri Lanka provide outstanding ,aterial in the respective topics, and is an invaluable collection of insights of persons who are highly knowledgeable and experienced in the topics oftheir choice. A trilingual interactive CD on the design and the security features of the new currency notes series will serve as a very important educational material for students and public. The central bank of sri lanka released its 11th series of currency notes on “prosperity, development and sri lankan dancers” on 4th February 2011 at the Dayata Kirula exhibition held at buttala. This book is authored by Mr. P Samarasiri, Deputy Governor of Central Bank of Sri Lanka. It contains academic discussion on basic financial subjects, i.e., financial system of Sri Lanka, money, monetary policy, financial markets, foreign exchange market, commercial banking, bank supervision, central banking and current global financial and economic crisis. The book is written in simple language covering theoretical and practical aspects of the subjects. Therefore, this book is a very useful academic volume to students of GCE (A/L), professional courses and universities studying finance and economics and their teachers as well as academia and policymakers. Retrospect, the coffee table book issued to mark this memorable occasion, provides a window to have a momentary look over a picturesquely presented social, political and economic backround through which the Central Bank carried out its operations since its inauguration in 1950. A series of publications published in association with the Regional Development Banks to enhance public knowledge and understanding about places of interest in the regions. Available in English and Sinhala.